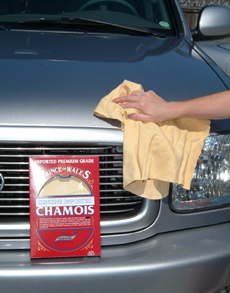 Home > Auto Detailing Tools > Towels, Chamois, & Drying Tools > Prince of Wales Chamois > Prince of Wales Chamois 4.5 Sq. Ft.
Chamois 2.5 Sq. Ft.Chamois 3.5 Sq. Ft. The quality of this chamois is top notch. It is soft, flexible and very absorbent. As a result there are no water streaks or leftover water spots. Unlike other chamois from local stores which average under 3 Sq. Ft. this one is 4.5 Sq. Ft. capable of drying almost any size vehicle. ConsCost more than other chamois. However, I think the quality and size of this chamois might justify the additional cost (ALMOST). Best way to dry your car and should last you years!